COMPARED TO MANY VARIETIES, McIntosh is a finicky apple. The creamy flesh beneath their thin skin bruises easily, and, more than most varieties, it is essential that they be kept cold after picking, or they go soft. Macs break down easily when cooked, and their flavor, so tart and crisp in the fall, mellows with age over time to a sweeter taste and pear-like texture. Their color is a variable mix of red and green, lacking the bold intensity of monochromatic varieties like the uniformly green Granny Smith or the ubiquitous Red Delicious. McIntosh is an heirloom variety, dating back to the early 1800s, and for years now, newer varieties with sexier names like Jazz and Pink Lady have attempted to challenge its supremacy. Yet today, McIntosh still accounts for nearly two-thirds of the New England apple crop. Given its quirky qualities, why has the popularity of McIntosh endured for more than two centuries? Simply put, the McIntosh is one great apple! Its fragrance is unrivaled, its flavor legendary, its versatility endless. It may require handling with care, but it’s well worth it. It wouldn’t be fall in New England without McIntosh apples. No apple eaten fresh better evokes the feeling of a New England autumn than McIntosh. Its juiciness and distinctive sweet-tart flavor spectacularly usher in the fall harvest, and should be savored and celebrated at every opportunity, whether at the grocery store, the farm stand, the farmer’s market, or the orchard. Whether you’re making applesauce, pies, crisp, or cider, make McIntosh part of the mix. Some people, for that matter, favor a mushier pie, and use all Macs for their superior flavor. Almost any dish is made better by including this aromatic apple. That New England grows some of the finest McIntosh in the world is no accident. Our rocky soils, long, hot summers, and crisp fall days are particularly well-suited for this variety, discovered on a farm in Ontario, Canada. With technological advances like cold atmosphere (CA) storage, McIntosh now retain their crispness and flavor throughout the year as long as they’re kept cold from the storage room to your table. THE EASTERN STATES EXPOSITION opens this Friday, September 16, and once again New England Apples will have a booth in the Massachusetts State Building. Come visit us to learn more about apples! For sale are many varieties of apples, fresh cider, apple pies and crisp, cider donuts, cider apple posters, and our new 2012 New England Apples wall calendar. It’s a beauty! Preheat oven to 350 ̊. Core and slice apples into a buttered 8” square pan. Sprinkle lemon juice over the apples. Combine topping ingredients to cover the apples. Bake for 45 minutes, or until apples have softened. Serves 6. 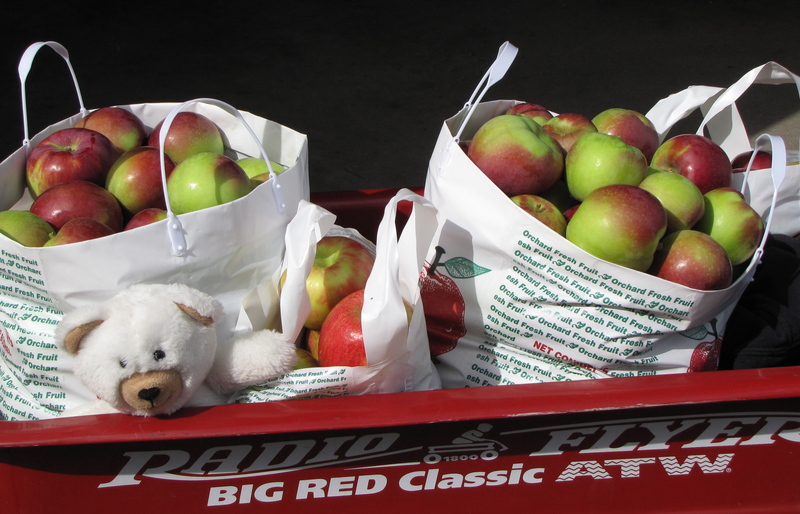 NEARLY EVERY New England apple orchard includes McIntosh among its varieties (we can’t think of one that doesn’t). But if you want to combine your Macs with some new or hard-to-find varieties, try the “Find an Apple” feature on the home page of our New England Apples website to access our variety index. Click on the apple you’re looking for to find where they are grown. You can find a wealth of information about New England’s apple orchards by visiting our Orchards by State page. Click on the appropriate state for complete listings from our orchards, including hours, directions, and varieties. Each listing indicates if the orchard offers pick-your-own or has a farm stand, and includes other products and special activities. From there, click through to the websites of individual orchards to see what’s available at the moment or to order products online. You can also locate an orchard in your area by clicking the “Find An Orchard” link at the top right of our home page and searching by zip code or map with our Virtual Orchard Finder. The forecast for this weekend — sunny, in the 60s — is perfect for apple picking. If you’re planning to visit an orchard, take a few minutes to watch the video below, which offers some suggestions about how best to prepare. Enjoy! Beautiful narration . . . and scrumptious-looking recipe. Macs are my favorite apple, and have always been.